We are a leading Manufacturer of commercial tilting grinder from Coimbatore, India. Our renowned company is considered amongst the prominent manufacturer, trading and supplier of the best quality Commercial Tilting Grinder. 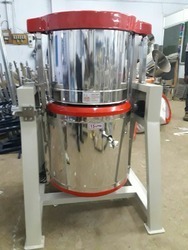 Used for used for grinding rice, pulses, preparing chutney, kurma and dal, provided tilting grinder is manufactured using supreme quality raw material and sophisticated technology under the supervision of our experienced professionals. In order to ensure its flawlessness, this tilting grinder is tested by our quality examiners on variegated parameters.